Description: Shell moderate in thickness, aperture about 50% of total shell length. Spire convex in outline, whorls nearly flat. Shell sculptured with beaded spiral cords. Aperture narrow, inner lip of aperture with 2 or 3 folds, the uppermost weak or absent; parietal wall with white callus. Outer lip with single strong fold or low denticle internally, without varix externally. Umbilicus open in immature shells, covered by the parietal callus in mature shells. Colour dark brown. Size: Up to 8.4 mm in length. Distribution: Tropical Indo-West Pacific. In eastern Australia, as far south as Sydney. The best-known locality for it in NSW is Bobbin Head, Hawksbury River, north of Sydney (Shea 1991). Habitat: This species is very hard to find alive throughout its range. It ;lives under and inside logs in mangroves and saltmarshes in the upper littoral (Ponder, Clark, & Dallwitz 2000). 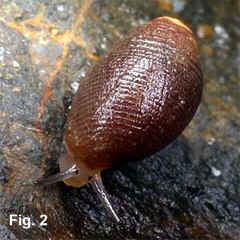 Shea (1991) observed that it seems to prefer living in cracks and holes underneath logs and wood pressed into the mud's surface. 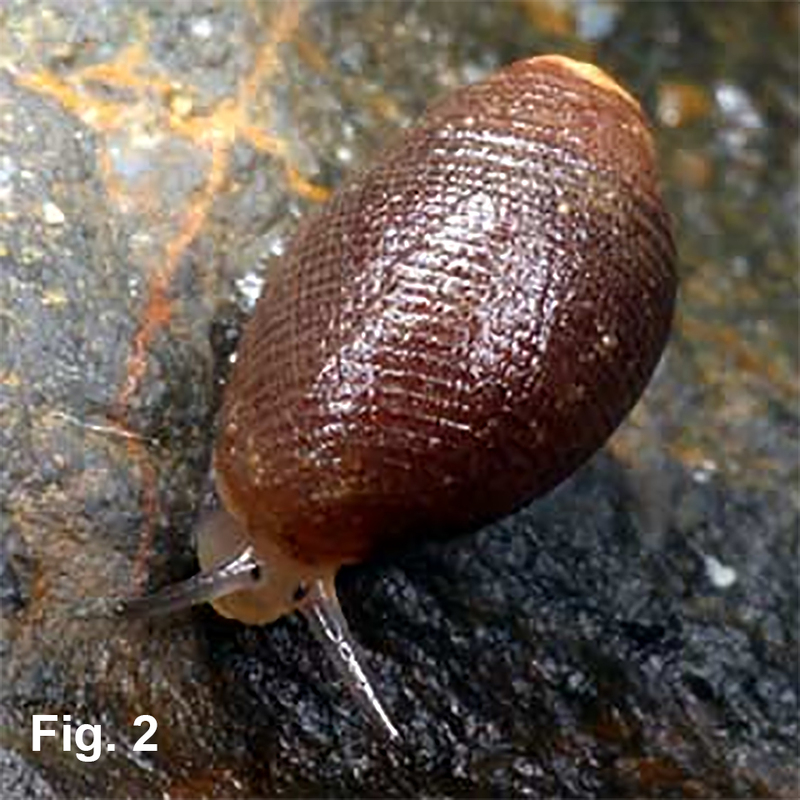 Comparison: This species differs from Laemodonta typica by being dark brown in colour, having only one fold or denticle inside the outer lip, and by lacking the strong varix outside the outer lip. Synonymy: Melosidula granosula Iredale, 1936 is a synonym of this species (NEW SYNONYM). 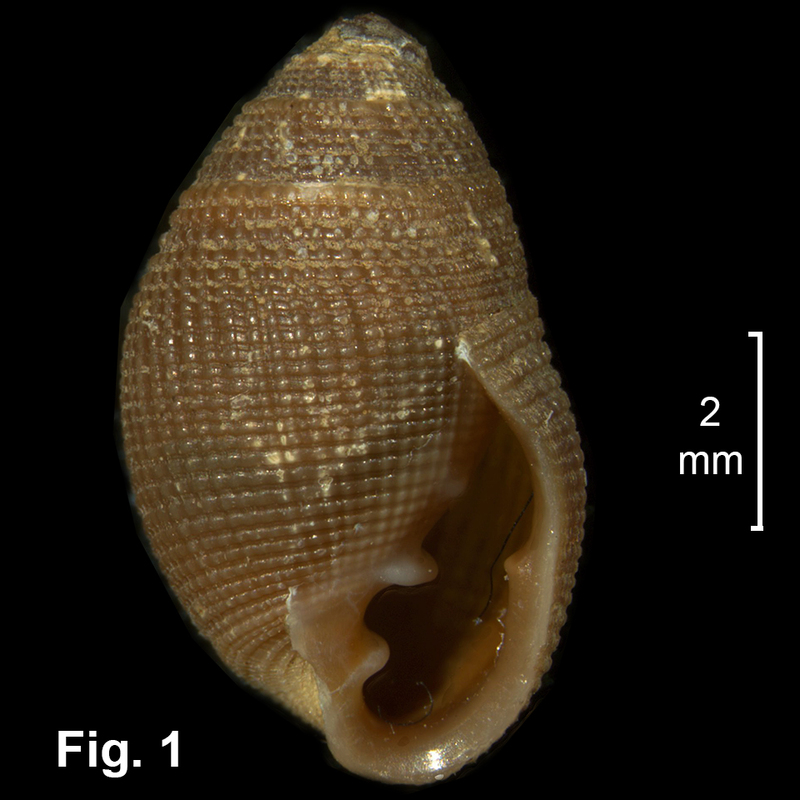 Comparison of the type with specimens of Laemodonta punctigera from NSW shows it matches the beaded sculpture, dark brown colour, presence of folds on the inner lip of the aperture, possession of a structure on inside of outer lip, and lack of an external varix. Remarks: Excellent photographs of living animals are given by Denis Riek, at http://www.roboastra.com/Mollusc5/brpr542.htm. One of these images is reproduced here as Fig. 2. Fig. 1: Bobbin Head, Hawkesbury River, NSW (C.167336). Fig. 2: Brunswick River, NSW. Image copyright Denis Riek, 2013.